LIXIL Africa has opened its new, exclusive showroom at Cape Town’s iconic Victoria & Alfred Waterfront, enabling more people in the Mother City to experience the joy of water. The space is a luxurious environment that offers premium solutions for every water need in domestic, hospitality or commercial properties. Product specialists are on hand to welcome architects, project developers, interior designers and the general public, sharing expert knowledge and inspiring guests to bring their ultimate bathroom or kitchen to life. The showroom, conveniently located at the entrance of Cape Town’s most prestigious shopping district, features full ranges of Cobra, Isca, GROHE, Vaal and Libra products, showcasing world-class kitchen and bathroom products that make stylish homes a reality for everyone. “Our new showroom reveals how a better home is made of surprisingly simple things, whether it’s creating a luxurious bathroom space to escape to after a long day, kitchens that unleash creativity, or showers and taps that let you experience water in new ways,” says John Westermeyer, Chief Marketing Officer LIXIL Africa. 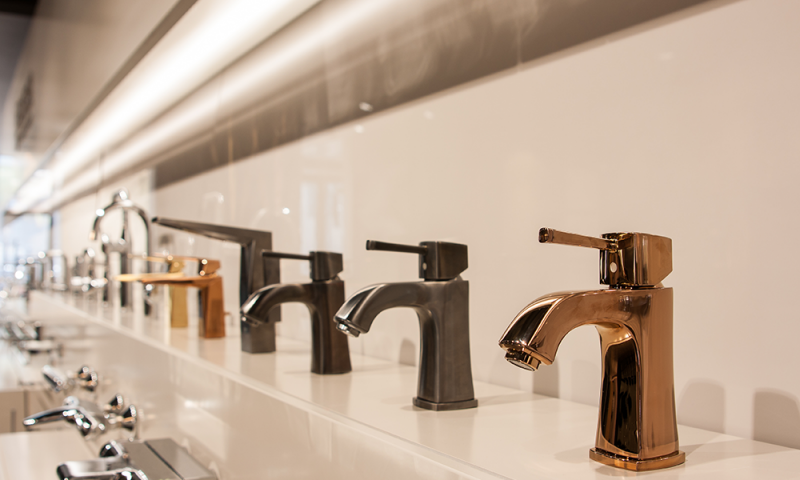 One of the most exciting solutions on display in the new showroom is the GROHE Blue Home. While the idea of sparkling water directly from your sink mixer may not seem real – this is a reality with the GROHE Blue Home, which has a simple and intuitive mechanism that lets you carbonate your drinking water at the touch of a button, providing you with deliciously cool, filtered still or sparkling water straight from the tap to your glass. More than a beverage solution, GROHE Blue Home helps reduce plastic use and spares users the hassle of having to purchase and store bottled water, before needing to dispose of the waste plastic. GROHE SmartControl epitomises a new dimension in showering with its ‘Push, Turn, Shower’ experience. Consumers, who enjoy a particular shower spray pattern, would like to switch patterns easily and are keen on a water saving shower experience will enjoy GROHE’s SmartControl shower technology. Its intelligent design allows for a personalised experience at exactly the right temperature – whether tension-busting hot, blood-pumping cold or just comfortably warm. The GROHE Minta Touch in two designs from GROHE ushers in a new era of kitchen mixer convenience, and visitors to the Cape Town showroom can experience this touch-sensitive mixer first hand. This highly hygienic, extremely reliable and impressively water-saving way of drawing water is made possible by innovative EasyTouch technology. The new LIXIL showroom also displays a wide range of premium sanitary ware, including the iconic Kate Woburn freestanding bath. Simple in design yet rich in elegance, the beautifully sculpted style of this modern classic is timeless. Available in two sizes, the Kate Woburn bath is the defining element of a tranquil and stylish bathroom. You can visit the LIXIL Africa showroom at 3 Dock Road, Victoria & Alfred Waterfront, Cape Town. Operating hours include; Monday to Friday 09:00 – 18:00 and Saturdays 10:00 - 13:00.